Otherwise known as Estofado de Conejo en Tomate in Spanish, this simple rabbit recipe is easy, requiring only basic cooking skills. It is common for Spanish to eat rabbit and small game birds often. Rabbits are easy to find in any local food market or chain supermarket in Spain. 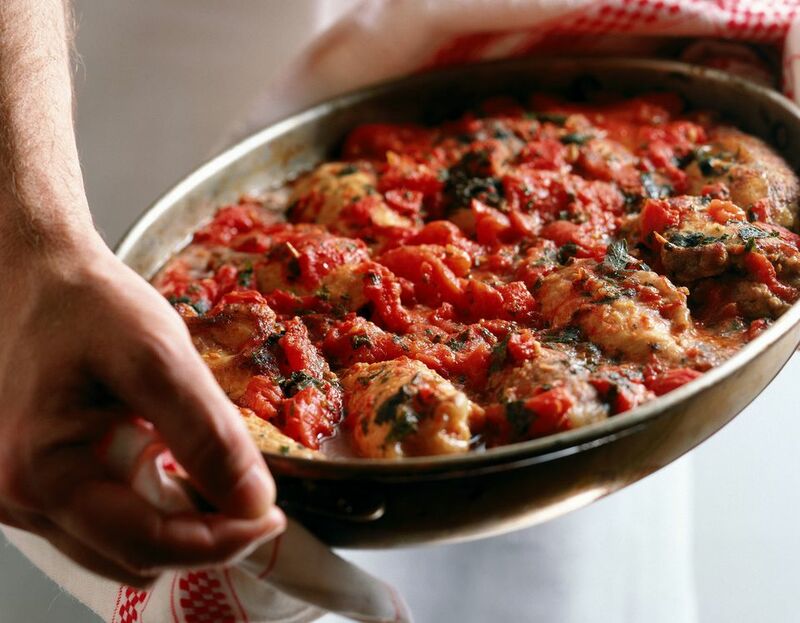 This recipe cooks the rabbit in a rich tomato-wine sauce and is delicious. Serve in a bowl with home-fried potatoes. Tip: Ask your butcher to cut up the rabbit and the recipe will be even easier! If you can't buy rabbit in your local grocery store, use chicken. It tastes just as wonderful and chicken requires much less cooking time to be tender. Clean the rabbit, if necessary. Cut rabbit into small pieces (approximately 12 to 15 pieces). Chop onions, garlic and celery. Pour enough olive oil into the bottom of large, heavy frying pan and heat on medium high. When hot enough, place rabbit in pan and brown the pieces on all sides. Remove and set aside. Using the same pan, sauté the garlic, onion and crushed tomatoes for about 5 minutes. (If ingredients begin to stick, add more olive oil if necessary.) Add the bay leaf, tarragon, thyme and chopped celery. Return the rabbit to the frying pan. Add the white wine and stir. Turn the heat up to bring to a boil and reduce the liquid by a half or two-thirds. Then, add the water and stir. Reduce heat. Cover the pan and simmer gently until cooked through -- an hour and a half to two hours. (If using chicken instead of rabbit, it will take only 30 to 45 minutes.) While the meat is simmering, chop parsley. Adjust salt and pepper. Sprinkle with chopped parsley and serve hot in bowls with fried potatoes and rustic bread.